Do I go to her parties? Q: It has come to my attention recently that I am once again being made a villain in a story I didn’t realize I was part of. To make a long story short, I had a falling out with a friend about five years ago (whom we will call Saga due to the ongoing saga-level drama she brings into everyone’s life). The end of the friendship itself did not bother me, but her not-so-subtle stabs at me during her Facebook rants and constant back-talking about me to our mutual friends did bother me a lot. I did everything you could name—confronted her in a non-threatening manner, voiced concerns to close friends, kept it to myself—and I promise you that absolutely none of that worked. She is one of those types that loves to wallow in self-pity and never get help. Can My Sister Still Ruin The Wedding If I Don’t Make Her A Bridesmaid? Now she is engaged. That’s great; I’m a huge fan of wedding planning, helping make budgets for weddings, finding discounts, you name it. Of course, Saga is also someone who enjoys wedding planning. However hers goes beyond the typical “excited for my wedding” trope. You see, about six years ago her sister got married, and to summarize, she took over everything. And now that Saga is getting married, her sister is begging me to be a guest at all of Saga’s parties. Here’s the fun part: when asking Saga’s sister if I was invited to the wedding or wedding reception, she got extremely uncomfortable and quickly changed the subject. Something is telling me that’s a huge no. Saga’s bridal party is coming up in a couple of months. I don’t want to go; I have zero interest in giving her any impression that I actually support her. However if I don’t show up, I’ll be seen as a passive-aggressive two-faced snake that won’t support the woman she’s known since diapers. Do I grin and bear it, give her a cheap $10 bralette, and call it a day? Or do I stand my ground and let her know that I won’t show up unless I’m invited to the reception as well? I hate dealing with this nonsense, especially at twenty-eight and being in my own relationship with a wonderful man whom I’ve known since high school (Saga has sworn up and down to everyone we know that I stole him from her, but that’s a different mess). I could really use some help here as to what to do. Thank you!! Do you honestly think this bride wants you at her bridal shower? I’m going with a big fat “nope.” It sounds pretty unlikely that she’d want you there. And this shower isn’t about her sister, it’s not about you, it’s not about what people will think about whatever dramatic situation is going on between you. 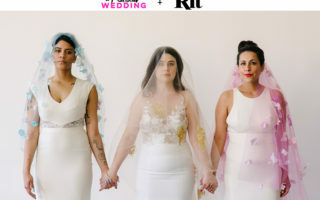 It’s about who this brides want to celebrate with. And the answer is probably not you! Here’s the thing about drama, sagas, etc. It takes two, baby. You’re either a part of this mess, or you’re out. Based on this letter, it sounds like you’re feeding the drama yourself. Whether you’ve “known someone since diapers” or not, there’s no reason to entertain this kind of foolishness that has been going on for several actual years. You’re not friendly with Saga; there’s no reason to pretend you are. And there is certainly no reason to even consider going to her bridal shower.